The PokerStars Festival New Jersey $200 NL Hold'em PokerStars Open drew 157 players over four starting flights, creating a $30,458 prize pool. 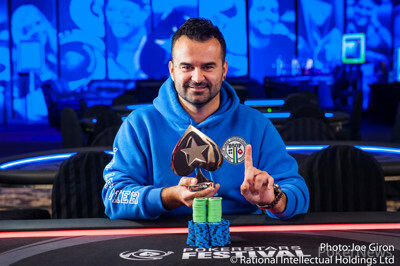 A total of 32 players pushed through to Day 2 Sunday and after seven hours of play, Eliano Mesquita was crowned the event's champion. A deal was reached three-handed giving Brett Gordon $3,559, Eliano Mesquita $4,082, and Ryan Meese $4,597. They originally left $1,300 and the trophy to play for, but Meese and Mesquita chopped that heads up, meaning Meese took second for $5,197 total, and Mesquita earned $4,782 and the trophy. Play moved quickly to the final table and just as fast once they reached it, with Mesquita busting Garrett Smith ninth, flopping a set of fours against Smith's fives and holding on. Bradley Snider took eighth running tens into queens and Samuel Warren was sent home seventh losing a race to Meese. Gordon took care of last-woman-standing Marina Lios sixth with his pair holding against Broadway cards and Darren Maglio took fifth when Mesquita turned suited garbage into a flush to bust him. Meese soon moved over the one-million-chip mark and sent Tom Pschar home fourth, jammming queen-high from the small blind. Pschar called with jack-high and made a pair, only to see Meese get there, making a one-card straight on the river. They struck the deal three-handed and it wasn't long before Gordon ripped it in with queens and Mesquita called with king-ten, finding a magical king on the flop to rail Gordon third. Meese doubled into a big lead heads up, but after Mesquita doubled back into it and inched ahead, the deal was struck to give him the win. Eliano Mesquita and Ryan Meese agreed on a deal involving the remaining $1,300 in prize money. Meese gets $600, while Mesquita gets the other $700 and the trophy. Officially, Ryan Meese finishes runner- up for $5,197, while Eliano Mesquita earns a first-place prize of $4,782. Ryan Meese raised from the button to 65,000 and Eliano Mesquita called from the big blind. The flop was and Mesquita checked to Meese who bet 80,000. Mesquita check-raised to 225,000, Meese called, and the turn was the . Mesquita bet 150,000, Meese called, and the river completed the board. Mesquita bet 350,000 and Meese folded. Eliano Mesquita limped the button, Ryan Meese made it 70,000 and Mesquita pushed all in for 450,000 total. Meese called with the and looked good to win it all versus Mesquita's . However, the board rolled out , giving Mesquita trip kings, the double up, and drawing the final two combatants closer to even. Eliano Mesquita limped the button and Ryan Meese checked his option. The flop came down and Meese led for 45,000. Mesquita raised to 900,000 and Meese called all in for 885,000 with , leading Mesquita's . The turn and river completed the board, further improving Meese's hand to a full house to double up. Ryan Meese opened to 55,000 from the button and Eliano Mesquita called from the big blind. The flop came down and Mesquita check-called 75,000 from Meese to see the turn. Mesquita led for 75,000, Meese raised to 230,000, Mesquita reraised to 430,000, and Meese folded. Brett Gordon open-shoved his last 300,000 or so and Eliano Mesquita called from the big blind with the , having him covered. Gordon looked good to double with the , but it was not meant to be. Mesquita paired his king on the board and sent him packing third. It's now heads up for the additional $1,300 and the trophy.